Who stole Church of Our Lady from Starkey Hill? At that point, the church is a ghostly apparition. You can see the twin spires poking gingerly above the distant drumlins and the view is often hazy, like in this photo, taken about 10 years ago. The church looks all by itself, with not much else of the Guelph skyline visible. The view is a reminder of several things: that Starkey Hill is quite close to Guelph (eight kilometres, as the crow flies), that our Wellington County landscape is very hilly, and that Starkey really is the highest point for miles around – 1,250 feet above sea level, even though the hill stands only about 150 feet higher than the surrounding countryside. Church of Our Lady, measured to the top of the spires, is actually 70 feet higher in elevation than Starkey Hill, although you can’t tell that by looking from the trail summit. Seeing the church near the end of a hike always felt like a reward for my labour. It was a familiar friend, and a confirmation that all was right with the world and our city. I hadn’t hiked the trail for a couple of years when I returned there recently on a warm Saturday. As usual, the parking lot was brimming with activity by early afternoon. There were families, kids, seniors and dogs coming and going, and a bicycle was locked to the sign by the road. I started walking and immediately wished I hadn’t worn my puffy vest, because the first climb warmed me up quickly. I was circling the loop in a counter-clockwise direction, which should have brought me to the familiar church vista within 15 minutes or so. Except, the familiar view of the church was missing when I reached the top of the summit hill. Huh? Had I been imagining things? A big church like that can’t just disappear! Maybe I was mixed up because I was hiking in the “wrong” direction (I usually go clockwise, and the trail markers also work that way). I continued, hoping I would come to the overlook soon, but my hopes soon faded as I walked downhill and the pine forest closed in around me. 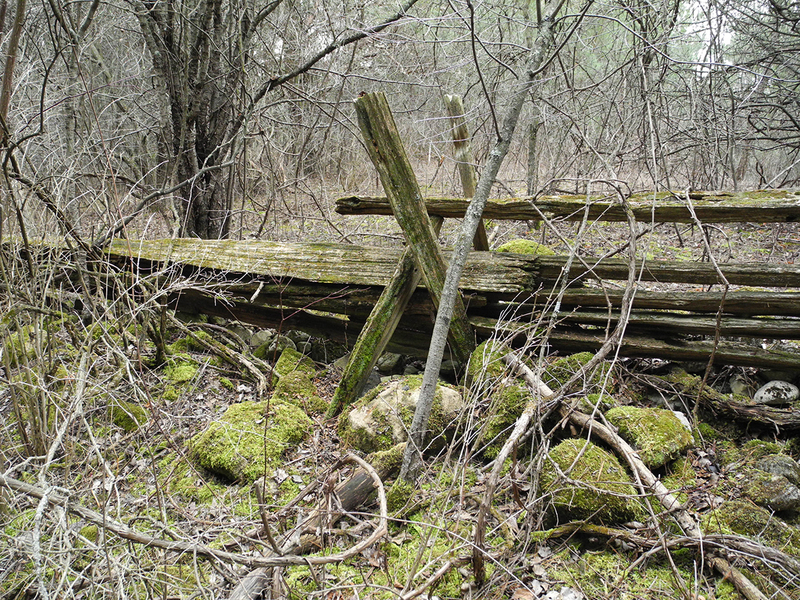 I stopped worrying when I reached the western edge of the loop and saw the ancient cedar rail fences that surround much of the property, built atop piles of stones. As hard as it is to believe in the middle of a forest, the stones were put there by the 19th century settlers as they cleared fields by hand and built fences to contain their livestock. Starkey Hill looks very different now than it did back in the day when it was being farmed by Richard and James, the third generation of Starkeys on the Puslinch property. The two brothers (and later, their wives Margaret and Grace) ran the farm from the 1930s until they sold it to the Grand River Conservation Authority (GRCA) in 1972. The two brothers died later that same decade, and had no children. According to the historical society, no Starkeys remain in Puslinch township. 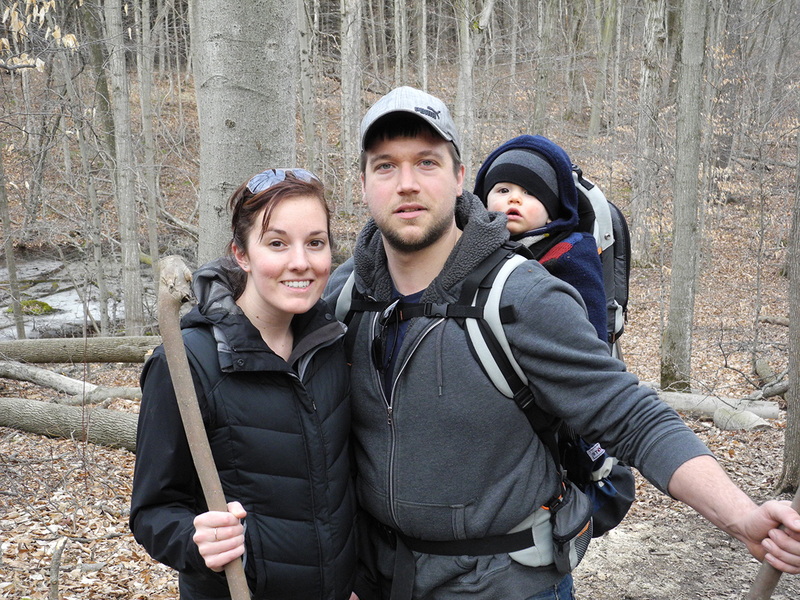 The 200-acre property sits across the road and just above the huge city-owned tract of land called Arkell Springs, which provides most of Guelph’s groundwater supply through a large network of wells and pipes. Immediately after buying the property from the Starkeys, the GRCA planted about 100,000 pine trees on Starkey Hill. Their plan was to stabilize the soil, encouraging rainfall to soak into the ground and feed the aquifer that supplies the city’s wells, rather than running off into the streams and down the nearby Eramosa River. 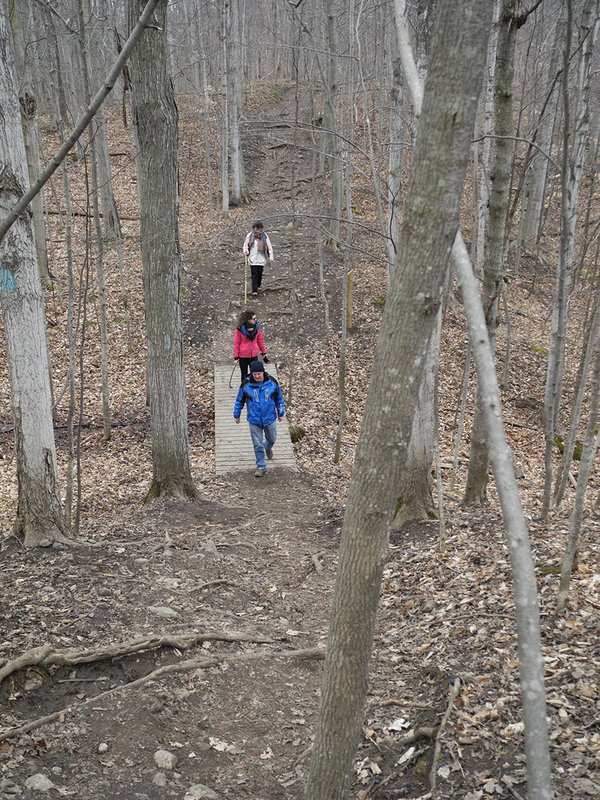 I continued around the trail, passing a group of teenagers out for a hike, which was a change from the predominance of young families with children and the multitudes of dog walkers. 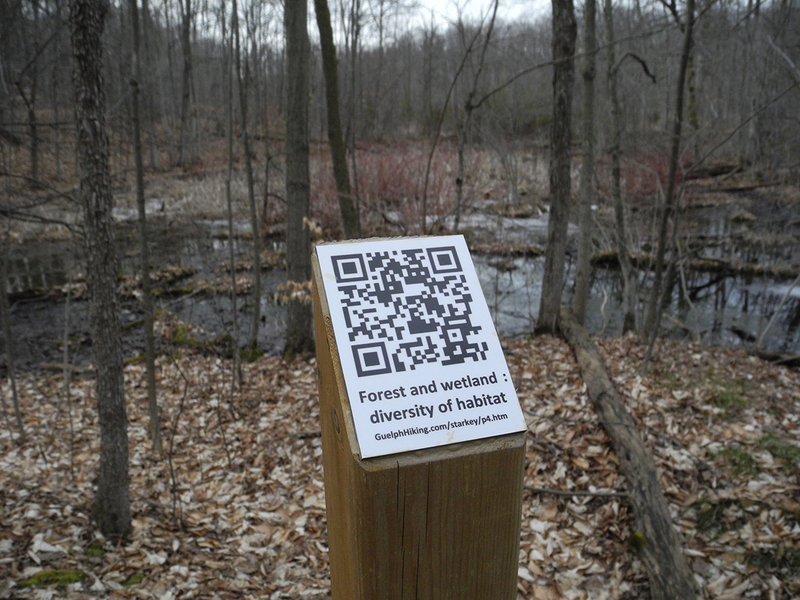 I soon noticed a new feature of the trail, the “QR (Quick Response) code” markers on posts, which allow you to use a smartphone to connect to a webpage with a description of what you’re looking at – a high-tech version of the interpretive sign. This system was first installed in 2012 and then updated last summer. It replaced the old number-and-map system that was formerly used for trail interpretation. It now includes 13 stations with details about history, geography, plants, trees, birds, animals, and even mosses. To tell you the truth, I wasn’t that keen on looking at my smartphone while out for a hike; I wanted to be aware of my surroundings instead. I took a picture so I could connect to the website later and learn more about the geography of the area. I noticed the large number of ponds and wetlands, which are prominent in the early spring with little foliage on the trees. As I reached the southern edge of the property, where maples and other hardwoods predominate, I could see through to the wetland areas, which the trail mostly avoids, for obvious reasons. I learned later (from the website) that these are “kettle lakes”, a remnant of the last ice age, when the weight of ice chunks created small depressions, which now fill with rain water. They are ponds really, not stream-fed or drained like lakes. 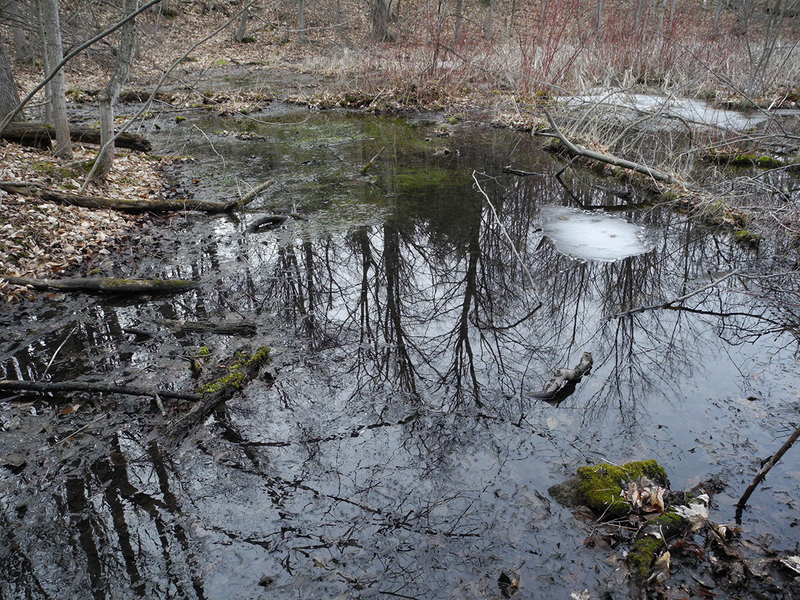 Their water seeps into the ground and eventually joins the aquifer that supplies Guelph’s water. I also discover that the property is part of the Paris-Galt moraine, a long series of ridges left by the action of glaciers. Starkey Hill itself (at the summit) is a classic “drumlin”, a small hill also created by glaciers. If a moraine is like a narrow lake, running for many kilometres, then a drumlin is like a wave, a single feature, with a characteristic, teardrop shape when viewed from above. Church of Our Lady also sits on the top of a drumlin, of which there are about 300 in the Guelph area, all oriented in the same direction, again like waves in a lake. Soon I discovered another new Starkey Trail feature – low bridges or boardwalks, no handrails, but designed to easily cross the wetter sections of the trail. I later learn they were installed from 2013–2015, to increase accessibility (and lessen wet feet! ), with money and volunteer labour provided by Toyota Canada. At the eastern edge of trail, in the back corner of the property, I’m surprised to see many hardwoods, freshly felled and sitting on the ground. I’m puzzled. They look like strong, healthy trees. They’re not maples, which I know well, but they have the same light-coloured wood, and I wonder why they’ve been cut down in the middle of this beautiful, deciduous part of the trail. I suspect this would have been the Starkey’s woodlot half a century ago, perhaps where the brothers made maple syrup if they ever tried that, in addition to their horse farming and grain production on nearby fields. He explains what’s up with the newly cut trees. They are ash, and are infested with an Asian beetle called the emerald ash borer that is killing them all over eastern North America. Felling the trees is an attempt to halt its spread, although like the Dutch elm disease of an earlier generation, the borer may all but wipe out an entire genus of trees. To my surprise, he claims you can still see it. I thank them for solving my mystery, and continue around the trail a second time, to see if I can spot the church. Now that I have Adam’s assurance, I look more closely, and spot a small “window” in the pine trees. It’s another hazy day, I don’t have binoculars, but far, far in the distance I can see … a water tower. Hmmm. I climb up on the bench to get a better angle, and now I can glimpse the familiar twin spires, partially covered by a young pine bough blowing in the wind. I’m glad I’ve found it, but I’m also disappointed, because I fear most people will not. Repeat hikers will surely miss it, and newcomers will never know it is (or was) there. I take up the mystery later in more detail with Jim Hoare, the trail captain, and also with Bob Fanning, who surveyed and designed the trail for the GHTC nearly 40 years ago. Jim says that when he got married up there, you could easily see the church, and in the other direction (sitting on the bench looking southeast) you could see the village of Acton. Since then, the trees have grown up and now envelop the drumlin. The GRCA trimmed the trees in 2006, and again a few years ago, to restore the view towards Guelph. However, the conservation authority staff are now preoccupied with thwarting the ash borer, and before that, they faced a huge cleanup after the ice storm of early 2013, which took until June 2014 to accomplish. There has been no time for aesthetics like … re-cutting the view of Church of Our Lady. I later speak with Martin Neumann, the former GRCA employee who wrote the master plan for its development. He says, “The plan for the property said not to plant the northwest slope of the hill, to preserve the view towards Guelph, but it got planted by mistake.” Although he doesn’t work for the GRCA any more (he’s now chief arborist for the City of Guelph), Neumann says “there’s no reason that view can’t be preserved, other than funding.” The GRCA declined to comment on the issue for this story. 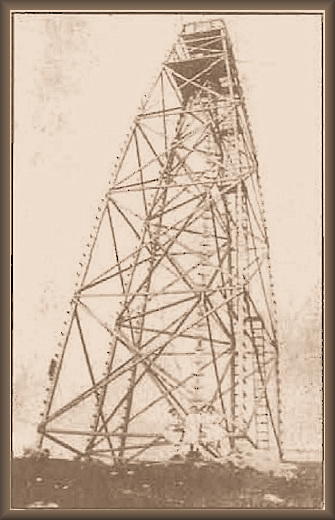 Historically, Starkey Hill was an aid in surveying the entire region, using a 100-foot wooden tower that briefly stood at the summit from 1911 to 1920. 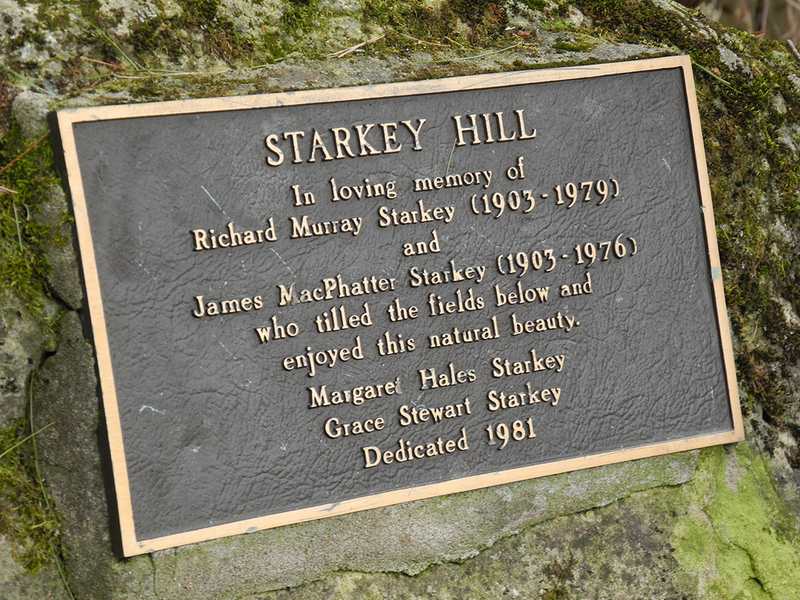 So, being able to see far in all directions is an important part of the history of Starkey Hill. The nearby Arkell United Church has held an Easter Sunday sunrise service on top of the hill at 7 am for many years, followed by a pancake breakfast back in the warm church. They did it again this year, but the event is missing the magic of being able to see the sun climb above the eastern horizon. As I leave the forested trail and walk down through the grassland section leading to the parking lot, I notice two new Guelph towers on the horizon, also sticking up above the distant hills – the two 18-story condo buildings recently built by Tricar near Wellington and Macdonnell. I sense an irony: we can see the “new” Guelph clearly from part of the Starkey Hill trail, but almost none of the old one. It’s like one view has replaced the other. When I get home I speak to Michelle Wan, a GHTC vice-president who spearheaded the revamp of the trail markers with the QR codes. She a fiction writer, with seven murder-mysteries to her credit, and is married to a botanist. She updated and expanded the interpretive material on the website just last year, and that’s what you connect to with a QR-enabled smartphone (a simple, downloadable app). She agrees that smartphones are not yet a universal technology, but explains the advantage of being able to offer richer, more up to date information on a web page, as well as avoiding the difficulty of maintaining signage on a long, foot-access only trail. Michelle describes the new system as “an investment in the very near future” and she believes the new technology will be easily embraced by a younger generation. 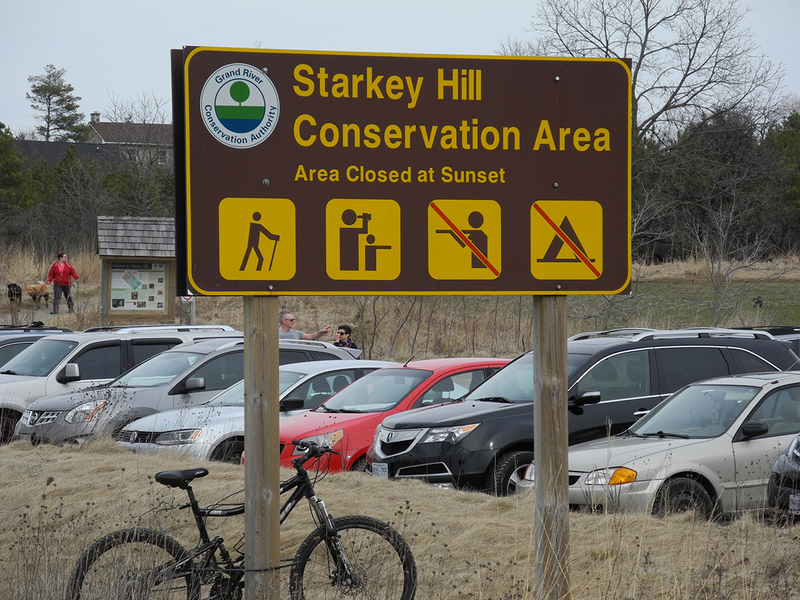 I come away from my recent hike, and my conversations with the Guelph Hiking Trail Club volunteers afterwards, with a deeper appreciation of this amazing resource and the behind-the-scenes work that goes into maintaining the Starkey Hill loop. Finally, I ask Jim how many people hike the trail each year. He tried to measure the usage electronically in 2013, but the system failed. I do a back-the-envelope calculation, based on the size of the parking lot and the popularity of the trail year-round on weekends, and even on weekdays with school tours, dog walkers and retirement-age hikers. “How about 7,000–10,000 people per year?” I ask. I hope the GRCA finds the time to do some branch trimming at the summit this year, because the payback in “church views” could be huge. The restored vista might even include the new and the old: the twin church spires and the twin Tricar towers, visible for the first time together from the top of Starkey Hill, a powerful visual reminder of Guelph’s past and its future. This article first appeared in the May 2016 edition of Guelph Life magazine. Photos are by Art Kilgour except the first photo (unattributed) and the recent shot of the church through the trees (by Dean Palmer). Interesting read. Makes me realize that I don’t know the Guelph area very well.